at 16 million to 13.7 billion years old. How unique is the Milky Way? To find out, a group of researchers led by Stanford University astrophysicist Risa Wechsler compared the Milky Way to similar galaxies and found that just four percent are like the galaxy Earth calls home. "We are interested in how the Milky Way fits into the broader context of the universe," said Wechsler. "This research helps us understand whether our galaxy is typical or not, and may provide clues to its formation history." The research team compared the Milky Way to similar galaxies in terms of luminosity - a measure of how much light is emitted - and distance to other bright galaxies. They found galaxies that have two satellites that are as bright and close by as the Milky Way's two closest satellites, the Large and Small Magellanic Clouds, are rare. Published in the May 20 issue of the Astrophysical Journal, the findings are based on analyses of data collected from the Sloan Digital Sky Survey (SDSS). The work is the first of three papers that study the properties of the Milky Way's two most massive satellites. Supported in part by the National Science Foundation (NSF), the SDSS is the most extensive survey of the optical sky performed to date. In more than eight years of operations, SDSS has obtained images covering more than a quarter of the sky, and created 3-dimensional maps containing more than 930,000 galaxies and 120,000 quasars. For this analysis, Wechsler's group studied more than 20,000 galaxies with properties similar to the Milky Way and investigated the galaxies surrounding these Milky Way "twins," to create a "census" of galaxies similar to the Milky Way in the universe. The work represents one of the most extensive studies of this kind ever performed. Scientists can also compare the SDSS data to galaxies simulated by a computer model. Since they are currently unable to see all the way back to the Big Bang, this is one way researchers are trying to understand how the universe as we see it today began. In order to learn more about possible conditions in the early universe, the group performed computer simulations to recreate the universe from specific sets of starting conditions. Then they compared their simulations to the SDSS data set. In this way, the group was able to test different theories of galaxy formation to determine whether or not each would result in a universe that matches what we see today. The results of their simulation matched the result found in the SDSS data set: just four percent of the simulated galaxies had two satellites like the Magellanic Clouds. "This is an excellent example of data-enabled science," said Nigel Sharp, of NSF's Division of Astronomical Sciences. "Comparing the 'fake' and 'real' Universes is how we discriminate between successful and unsuccessful theories. This work interconnects three of the four legs of science: theory, observation and simulation, for a powerful scientific result." 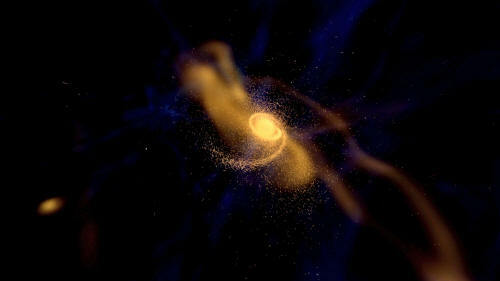 Their results also lend support to a leading theory of galaxy formation called the Cold Dark Matter (CDM) theory. This theory provides what many consider to be the simplest explanation for the arrangement of galaxies throughout the universe following the Big Bang. It assumes that most of the matter in the Universe consists of material that cannot be observed by its electromagnetic radiation (dark) and whose constituent particles move slowly (cold). Dark matter, an invisible and exotic material of unknown composition, is believed to influence the distribution of galaxies in space and the overall expansion of the universe. The rareness of this aspect of the Milky Way may provide clues to its formation history. "Because the presence of two galaxies like the Magellanic Clouds is unusual, we can use them to learn more about our own galaxy," said Wechsler. Using their simulation, the team identified a sample of simulated galaxies that had satellites matching the Milky Way's in terms of their locations and speeds. "The combination of large surveys of the sky like the SDSS and large samples of simulated galaxies provides a new opportunity to learn about the place of our galaxy in the Universe," said Wechsler. "Future surveys will allow us to extend this study to even dimmer satellite galaxies, to build a full picture of the formation of our galaxy." The theoretical and numerical work that produced the simulations used as a comparison for the SDSS data were supported by an award funded under the American Recovery and Reinvestment Act (ARRA) of 2009.